Felister Wanjiku Nderitu a wife and mother of two was in a dilemma. She lived in fear of getting an unplanned for pregnancy and at the same time she did not want to use modern contraceptives because she had heard negative stories about them. Therefore she was using natural family planning although she knew it was not as effective as modern contraceptives. While the unmet need for family planning in Kenya is at 18%, whenever they are available many women are still not using them due to culture, myths and misconceptions. Some believe that they will cause a health problem later in life, lead to weight gain or loss, cause birth defects in their next pregnancies while others believe that implants and IUCDs can dislodge from where they were inserted and travel in the body to cause complications such as heart attacks. Concerns of loss of sexual desire have also been raised among other misconceptions. In some cultures use of contraceptives among married women is seen to lead to promiscuity and straying. After the birth of their second born, Felister and her husband made the decision that they did not want another child but were not sure about how to go about getting a modern family planning method since they had heard many negative stories around modern family planning. Little did Felister know that the decision would come to her when she took her 6 weeks old baby for immunization at a Tunza facility nearby. Having done her first delivery at Sipili Maternity, a Tunza facitity in Laikipia County, she knew that that Tunza would give her the best direction. So now in her new residence in Olkalao, her mission was to spot another Tunza branded facility and came across Glaisa Medical Clinic. Felister happened to visit the clinic during a Tunza day which is a day set aside to talk to women about their reproductive health issues. 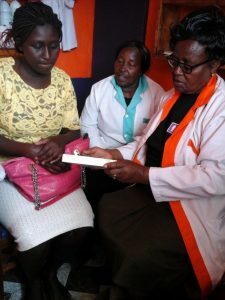 After taking her child for immunization, Felister joined other women and listened as the Tunzer worker explained the different modern family planning methods. “It was a very informative session and we even had the chance to ask the doctor questions about the things we had heard about the family planning methods. Her answers made sense and I decided to go ahead and take the implant,” said Felister. Inside the procedure room as Gladys counselled Felister about the implant, Felister opened up about her fears. “I explained to the doctor that I was afraid to go ahead because I heard that implant insertion involved a painful long surgical procedure and that they also cause someone to lose weight and get pimples. The doctor assured me that those were myths and that the procedure would take a few minutes,” narrated Felistar. And true to the doctor’s word, the insertion took only ten minutes, much to the surprise of Felister. ‘’Umeweka haraka kuliko vile nilikuwa natarajia hata sijaskia uchungu (You have inserted it faster than I was expecting, I have not felt any pain),” remarked Feliser. Gladys advised her to always seek advice from a healthcare provider instead of listening to what is said in the village so she can make the right choices about her health. In one Tunza visit, Felister had received a family planning method she was sure would address her needs and got her baby immunized.